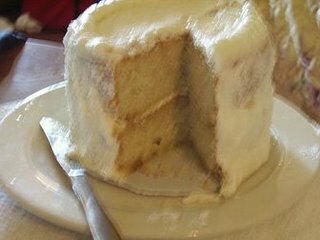 In Wedding Cake, Part 1 I discussed the pain at which my wife and I went to preserving our wedding cake for our one year wedding anniversary. In Wedding Cake, Part 2 I discussed the trip to my sisters wedding this past weekened and how much we enjoyed her cake and the transportation of our cake topper. On the morning of our anniversary we left the hotel we were staying at and traveled about 60 miles to Colorado Springs were we would spend our first anniversary with various adventures (Cave of the Winds, Garden of the Gods, and Seven Falls). For the majority of the day our cake was sitting in the cooler with the ice I had put in from the hotel the night before. When we checking in to the hotel, it was time to check in on the cake. The ice had melted, no surprise, but when I picked up the cake it was extra heavy. The water had melted and absorbed into the box. My wife and I laughed -- We knew it, we had ruined our wedding cake on the very last day of our first year of marriage. After 355 days of having to care for this cake, the annoying box that took up our whole refrigerator had turned into a wet soppy mess. I set the box on the patio of the hotel room for it to leak away while I called down to room service for 2 plates and 2 sets of silverware. Our curiousity would no longer allow us to wait. I laid out a towel on the table and my wife and I began using the knifes to cut through the plastic, and our hands could easily tear open the wet saturated cardboard. 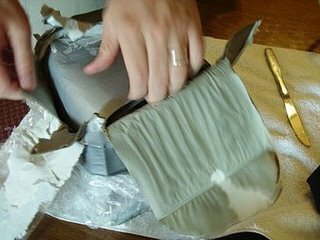 After peeling back the aluminum foil we were surprised to discover that the very inside layer of plastic seemed dry and as carefully as I could ripped open that last layer and dipped my finger in the frosting and offered it up to my wife. I could tell by her smile that it tasted good and we finished peeling off the exterior and cut a piece. Probably no more than two millimeters of the bottom were a little extra moist and the rest was perfect. "This taste like something they could sell at the store and no one would know the difference," my wife said. We were a little surprised when we cut into the cake that it was regular vanilla cake since we thought it was almond poppyseed, but it was delicious. My wife didn't particularly care for the concept of eating year-old cake, so after a few bites she was finished. But I enjoyed much of the cake over the next two days and was so pleased it wasn't dry, nor did it taste like dog food, nor did get ruined by the elements. That's awesome. Our wedding cake was entirely made out of styrofoam and royal icing, so we didn't eat the top a year later. My mother insisted on serving fruitcake. YUCK. After four daughters, three married, my freezer has had it's share of wedding cakes...can someone tell me where it is written that "Dearest Mum" must be the saver of wedding cake? good for you! i am glad that your cake turned out good- as i said in a previous post- ours freeze dried and it wasn't so good. :) happy versary! jeoperdygirl, i'm very sorry you had to endure fruitcake at your wedding. My wedding cake was carrot cake with cream cheese icing...yaHOO!!! Maybe the little bit of melting gave your cake the extra bit of moisture it needed! I can't believe it wasn't entirely ruined...that's a great story! Well, according to ancient Chinese proverbs: "He whose matrimonial cake has not disintegrated into a crappy mess after a year, shall enjoy long life of marriage success". You can't argue with wise Chinese proverbs. Well if you had just come 10 more miles past the Cave of the Winds, I woulda invited you guys over for coffee, damnit! Leave it to you, R to trail us along in your saga of the cake...you are pretty funny!